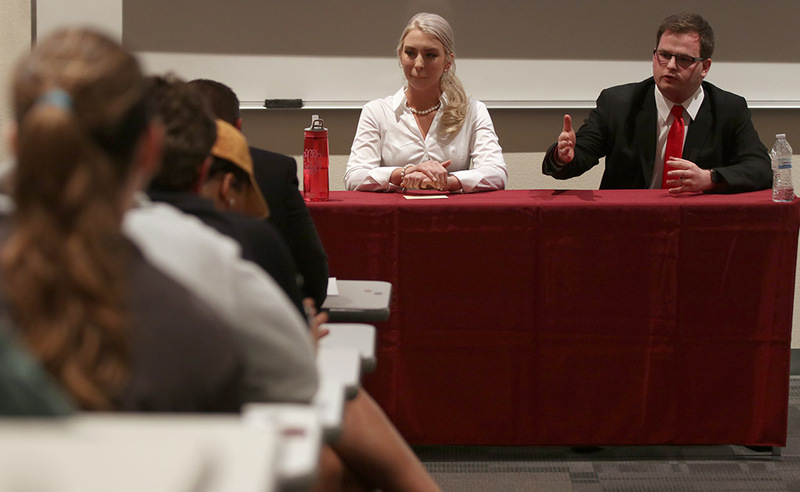 To give candidates running for leadership positions on the Student Government Association a chance to answer questions and debate against their competitors, SGA members hosted debates on March 8 in Bolin Room 100. Since two of candidates are running unopposed for their positions, they did not engage in debate and instead answered the questions presented by the moderator Jeremy Duff, associate professor of political science. The candidates answered a series of questions from the moderator to give stances on certain issues and present why they should be chosen for the positions their running for. Though SGA members did not plan to have students ask the candidates questions, after Markell Braxton-Johnson, sports and leisure studies junior, asked to give questions, the hosts allowed a limited amount of questions from students attending the event. Questions asked covered a variety of topics on campus, such as #ComplicitMSU, how candidates would deal with administrators and students during their terms and how the candidates would help organizations increase membership. The event was live streamed through social media for those who could not attend. What do you think the role of SGA is for the student body? What would be your main goal in your office? What do you think biggest issue facing students at MSU? CORRECTIONS: In a previous version of this story, Steven Ehlert’s last name was misspelled. The Wichitan regrets this error.